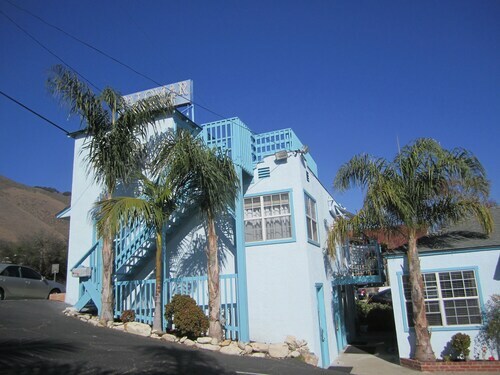 Located in the heart of Pismo Beach, this motel is within 1 mi (2 km) of Pismo Beach Prime Outlets and Pismo Beach Pier. Pismo Lake Ecological Reserve and North Beach Campground are also within 2 mi (3 km). 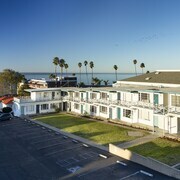 Situated by the ocean, this motel is 0.1 mi (0.1 km) from Pismo Lake Ecological Reserve and 1.4 mi (2.3 km) from Pismo Beach Pier. Pismo Beach Prime Outlets and Grover Heights Park are also within 1 mi (2 km). Grover Beach Station is 25 minutes by foot. 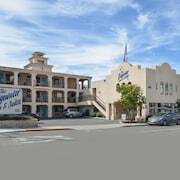 Situated near the beach, this motel is within 1 mi (2 km) of North Beach Campground and Pismo Beach Pier. Pismo Beach Prime Outlets and Monarch Butterfly Grove are also within 1 mi (2 km). Grover Beach Station is 29 minutes by foot. 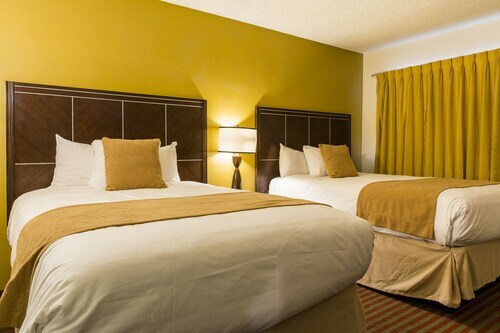 The golden sands of Pismo Beach are a 5-minute drive from this cozy hotel. 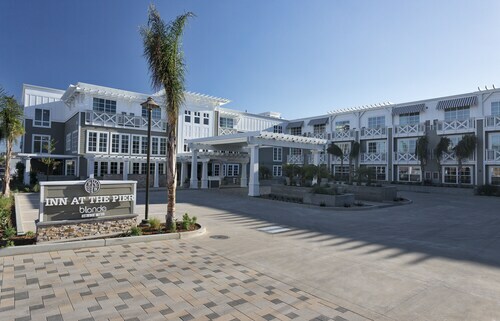 Travelers in need of retail therapy can walk 10 minutes to Pismo Beach Premium Outlets. From November to February, guests can visit the Monarch Butterfly Grove, 4 minutes away by car. 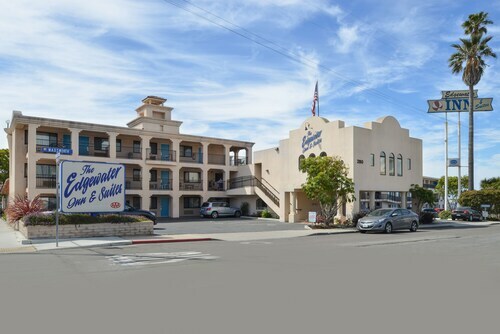 Offering direct access to the beach, this Pismo Beach motel is within 1 mi (2 km) of North Beach Campground and Pismo Beach Pier. Monarch Butterfly Grove and Pismo Beach Prime Outlets are also within 1 mi (2 km). How Much is a Hotel Room in Pismo Beach? 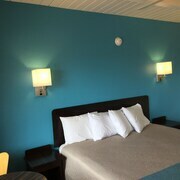 Hotels in Pismo Beach start at $60 per night. Prices and availability subject to change. Additional terms may apply. 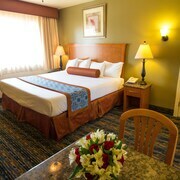 Travelers to San Luis Obispo will uncover a terrific range of accommodation options to select between in Pismo Beach. 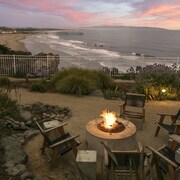 Travelocity's handy hotel guide includes 45 places to stay located within 6 miles (10 kilometers) of central Pismo Beach. Your family pet is there for you every step of the way, right at your side during your daily adventures. They can be the Watson to your Sherlock Holmes, the Jenny to your Forrest Gump, and the Robin to your Batman. That cuddle-worthy camaraderie doesn’t need to end when it’s time to take a break from the daily grind. “Bark Twain” is part of the family, and he goes where you go, wise wanderer. That’s what makes pet-friendly hotels in Pismo Beach, CA such a great idea. The two of you can sit high on a clifftop, overlooking the vast Pacific, and ponder each other’s existential questions—you, wondering why dog food comes in flavors that humans eat, and Bark, curious as to why you don’t chase cars down the street. Or you can scrap all that metaphysical mumbo-jumbo and enjoy a stroll along the sand in front of your dog-friendly hotel in Pismo Beach. There really isn’t a right or wrong way to approach it—you’re on vacation, after all. Where Are the Best Pet-Friendly Hotels in Pismo Beach? When it comes to area pet-friendly hotels, Pismo Beach proper is the way to go. You’ll be close to the shoreline, tourist attractions and dining options, and the ever-popular Pismo Beach Pier. 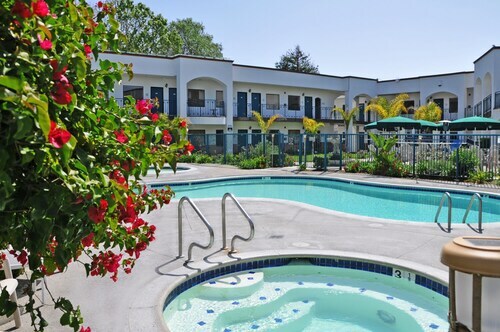 If your adventures are going to take you inland, you might want to reserve a room in nearby San Luis Obispo. Here are some of our favorite places for you and furry friend to call your home away from home while enjoying California’s Central Coast. SeaCrest OceanFront Hotel – Bark Twain may be the cat’s meow in your eyes, but you know he deserves the red-carpet treatment at all times—even on vacation. Show him how much you care with the Celebrity Pet Package from SeaCrest. You’ll receive a brochure with pet-friendly attractions and a gift certificate to a local eatery, and Bark will get his own plush bed and souvenir chew toy. Avila La Fonda – We all know that there is no better place for your four-legged friend to be than resting comfortably on your lap while you are getting lost in a novel. To really dive into the lap of luxury, though, enjoy a getaway at this upscale pet-friendly hotel in Pismo Beach. Please note, though, even though your guestroom has a two-person whirlpool tub, it’s best if Bark doesn’t take advantage of that amenity. Shore Cliff Hotel – How much does the Shore Cliff love dogs? They donate 10% of their pet fees to the local Humane Society. 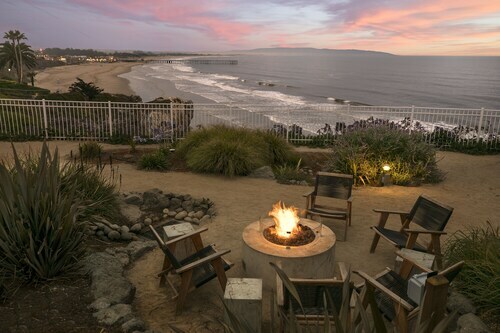 Plus, the amazing property—set high on the cliffs—is situated just a short stroll from Pismo’s premier dog-friendly beach and Dinosaur Caves Park, where Bark can party with the local poodles and mingle with out-of-town mastiffs. San Luis Creek Lodge – This charming English Tudor-style bed and breakfast is as cozy as it is sophisticated. Start your morning with a free full breakfast, then you and your pet can explore the Central California coast. Wrap up your day with a soak in the jetted tub, then relax with Bark in the warmth in front of the en-suite fireplace. Turn your trip into a family getaway for you and your furry kids. No more sending them to pet hotels or leaving them home alone to run amok in the house. Let Travelocity help you find the perfect accommodations that not only welcome your pets, but offer many services to help make your stay more relaxing. Things like on-site grooming and complimentary dog walking are some of the amenities provided—but having your best buddy with you is the most important feature. Who else is going to play catch with the driftwood that you find on the golden sand of Pismo Beach? Plus, can you really get a good night’s sleep without your furry footwarmer to keep you company? Don’t ever feel guilty about leaving your beloved Bark Twain behind when you go adventuring again. Travelocity wants to help the both of you enjoy a wonderful vacation together. Search our extensive inventory of the best Pismo Beach pet-friendly hotels and book your stay now. If you find a better doggie treat than a vacation with your pet, we’d love to hear about it. It’s a older hotel with lots of character. Staff is very friendly. Very clean! The beds and pillows were very comfortable. The sunset viewing from garden area was the best on whole coast - everyone was relaxed and friendly - We had a "view" of a parking lot - in back and front - but were only there one night so ok, but if you stay longer -request room not on south side - still great breakfast - cute lobby - and great bluff overlooking ocean - staircase was easy to beach, but for the younger set. Really nice experience. Would stay again. Friendly staff and a welcome reception. Ocean View Condo w/ Balcony, Walk to Beach/pier/downtown - Great for Long Stays!